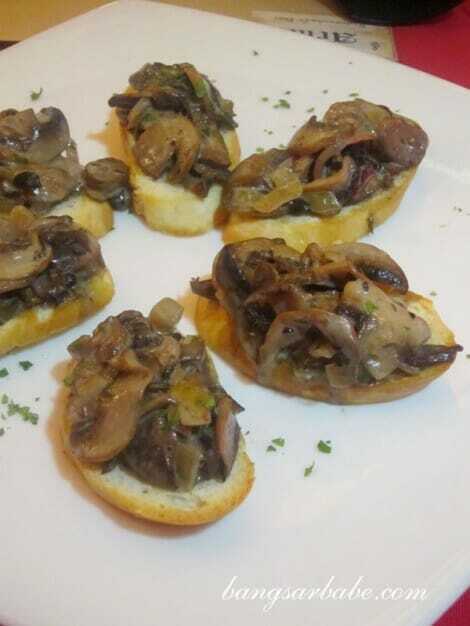 Ask any Malaysian what their favourite cuisine is and chances are, quite a number of them would answer “Italian”. I think most of us find it easier to enjoy Italian food because the flavours are often hearty, like Malaysian cuisine. 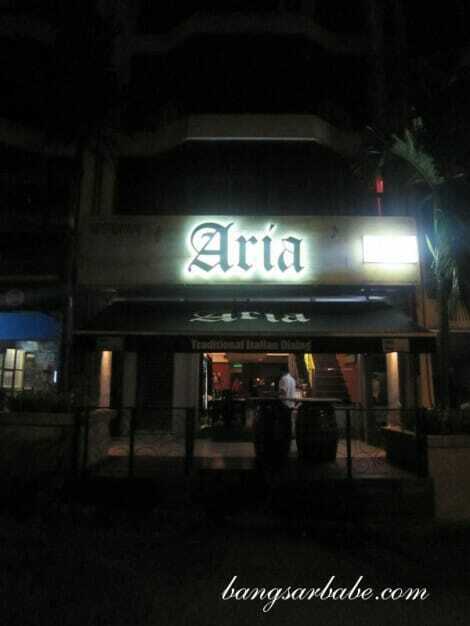 In Plaza Damansara, one can find Italian solace in Aria Restaurant. This neighbourhood eatery claims to serve affordable and authentic Italian cuisine and I was invited to sample some of their dishes last week. 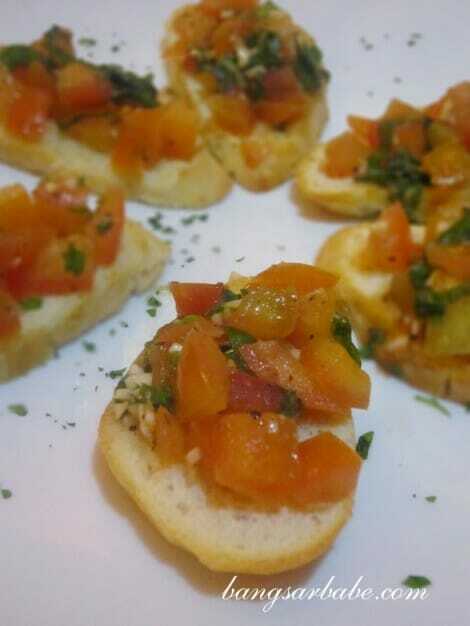 We had some bruschetta to nibble while waiting for our food. 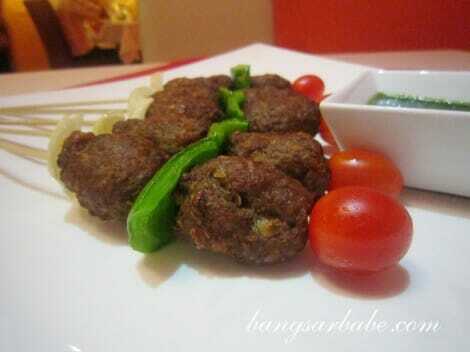 Simple but tasty enough to pacify a hungry diner like me. 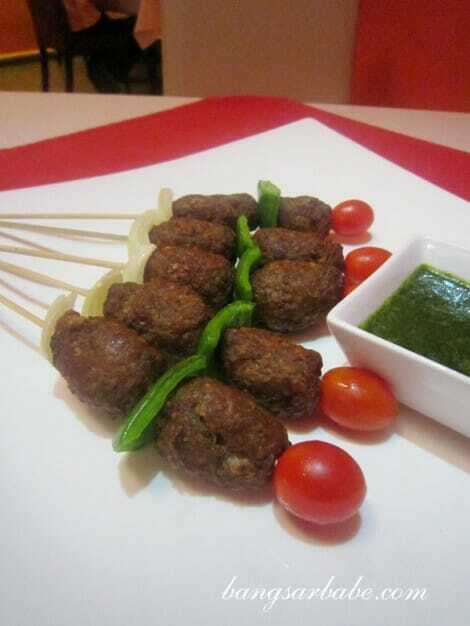 The Lamb Kebab with Aria’s Special Mint Sauce (RM28) isn’t Italian; but it works well as a snack. I didn’t care much for this, but rif loved it. The lamb, minced and combined with onion and birds eye chilli, was meaty and relatively moist. I thought the mint sauce gave it a nice edge and helped offset the strong flavour of the meat. 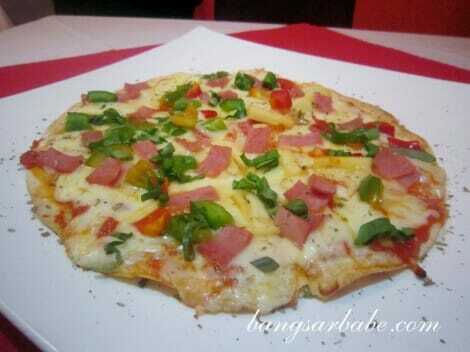 I expected the Hawaiian Pizzeta (RM26) to come with a thin and crispy crust with charred edges. Aria’s version had a thin base, but it wasn’t crispy nor was it charred. That said, the topping was generous – plenty of turkey ham and cheese to go around. 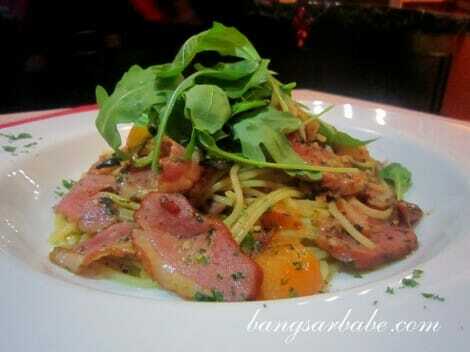 The Aglio-olio Smoked Duck Pasta (RM36) was a highly recommended dish which featured smoked duck slices, cherry tomatoes and rocket salad among other ingredients. I found this quite good – the duck was flavourful and pasta was al dente – but it didn’t knock my socks off. 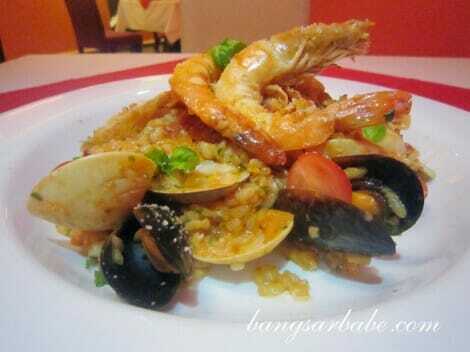 Seafood Risotto....or more like a seafood platter! 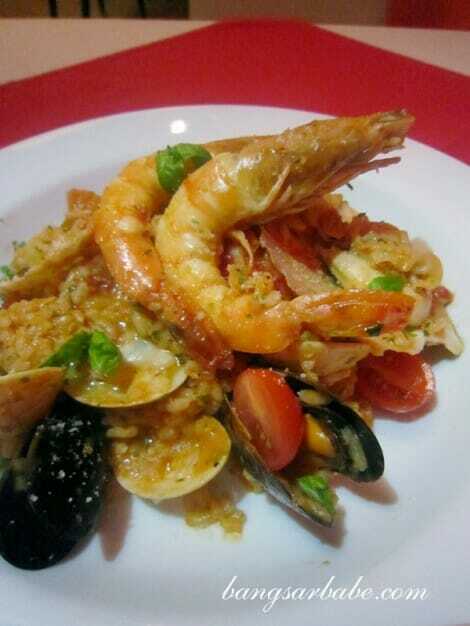 What did was the Seafood Risotto (RM36), a beautiful medley of prawns, squid, clams, mussels and scallops on a bed of tomato-based risotto. I felt like a horrible Little Mermaid who ate all her sea friends. I never order tomato-based risottos because they don’t have the creamy and rich flavour cream-based risottos have. But Aria’s version proved me wrong. This was tangy, creamy and rich with a burst of sweetness from the fresh seafood. I relished every spoonful. Grilled Tenderloin (RM70) was of a hefty portion but I would have preferred the rib eye or prime rib; I’ve never been a fan of lean beef. To be fair to Aria, this was nicely executed. 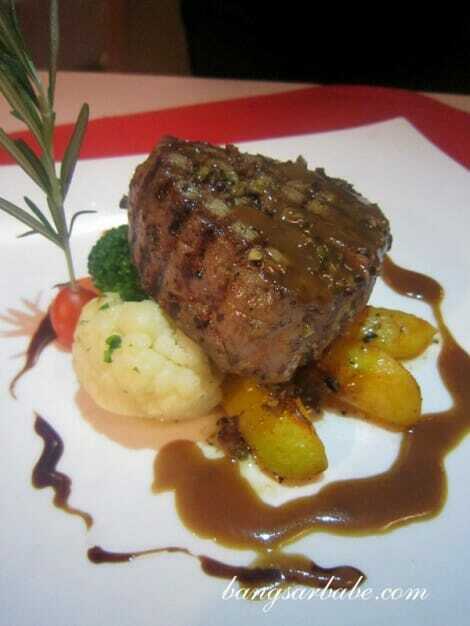 The beef was cooked medium rare and served with sautéed vegetables and roasted potatoes. You get a choice of garlic rosemary, black pepper or brown sauce. 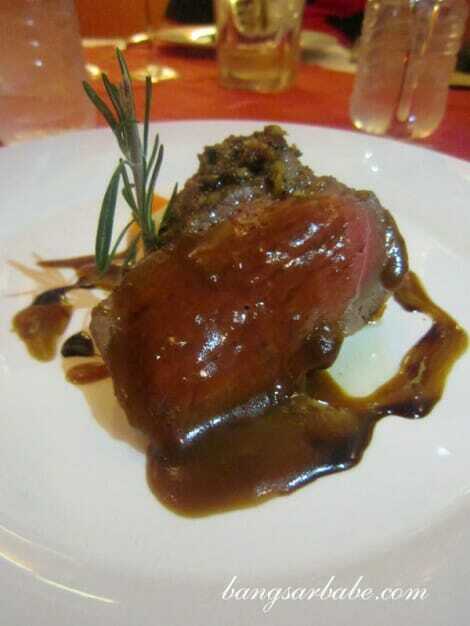 If you like to eat your steaks without sauces, do inform the waiter beforehand. 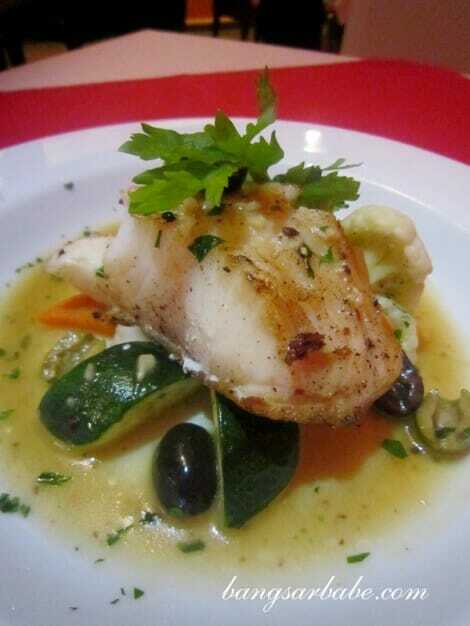 I enjoyed the Merluzzo Canadese Atlantico (RM65), Italian for Canadian cod fish, better. The fish was perfectly cooked and notable for its rounded flavours. I liked how the olive tapenade and Mediterranean sauce added a lovely aromatic and grassy flavour to the delicate fish. Aria also boasts a comprehensive whisky bar, comprising single malts such as Macallan (12 and 18-year), Auchentoshan (12 and 18-year), Clynelish (14-year), blended Hakushu (12-year) and single malt Yamasaki (12-year). 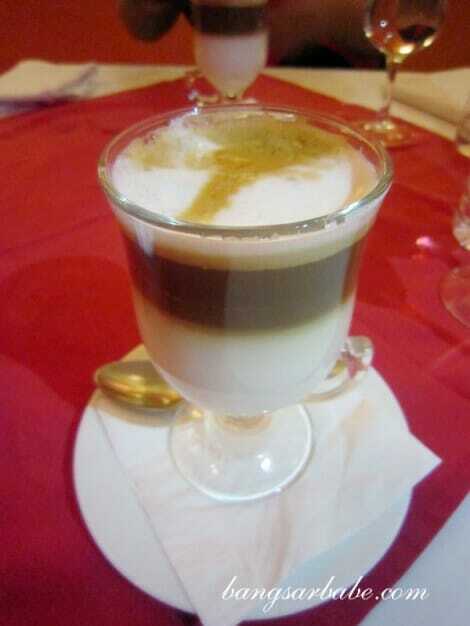 To cap off the meal, I had a cup of three-layer latte with the Classic Tiramisu (RM20) and Apple Strudel with Custard Sauce (RM23). The latte was most interesting – prepared like the local 3-layer tea, I was tempted to ask for a double shot but stuck with one as it was already 11pm. 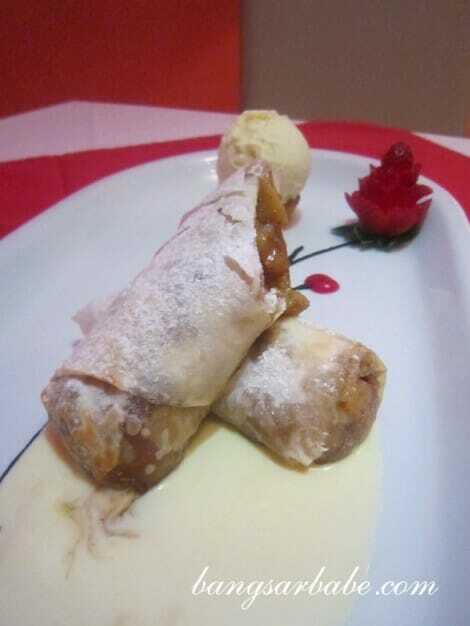 I preferred the apple strudel to the tiramisu as the pastry was flaky and the filling wasn’t overly sweet. 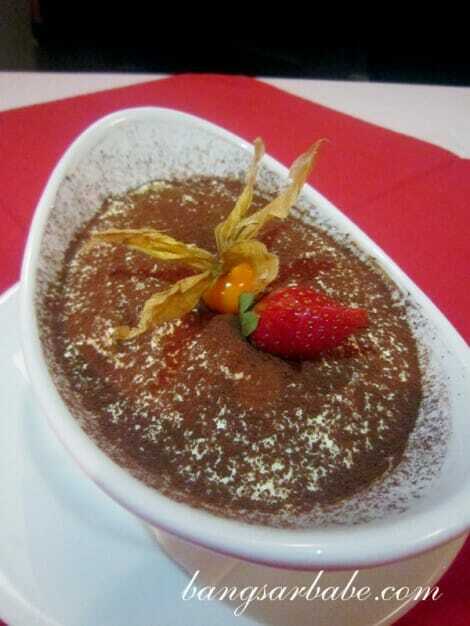 The tiramisu was alcohol-free, so that explains why I’m not a fan. In my opinion, not all the dishes at Aria are traditional Italian but the risotto and cod fish were strong winners that night. Prices are affordable, considering how it is located in an up market neighbourhood. RM36 on a generous place of risotto seems fair. 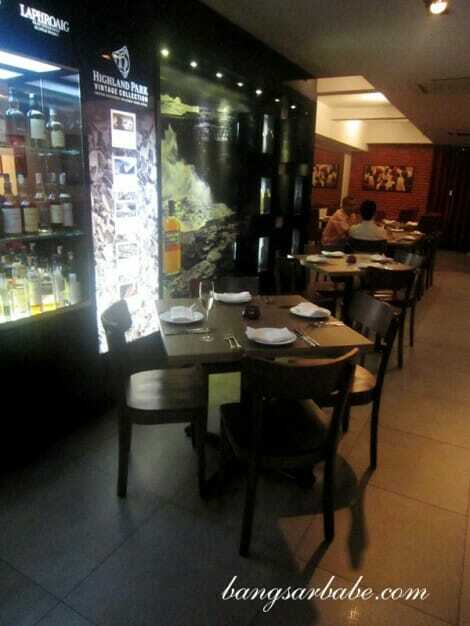 Verdict: Try the seafood risotto and the cod fish. Delizioso! 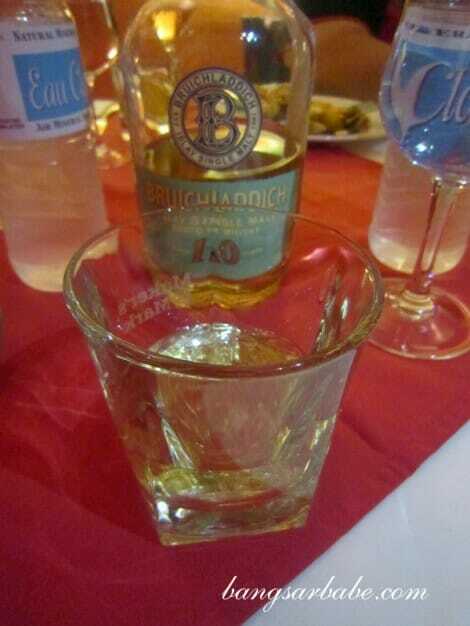 n i think d alchohol free tiramisu is very disappointing…. 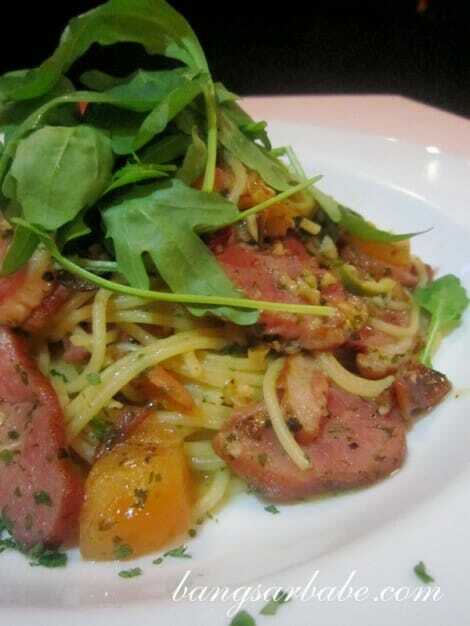 Love their food.. especially their smoked duck pasta, taste very great.. It was a favourite that night too! Hahaha! Me too, me too! Oh my favorite cuisine is French, followed by Japanese. 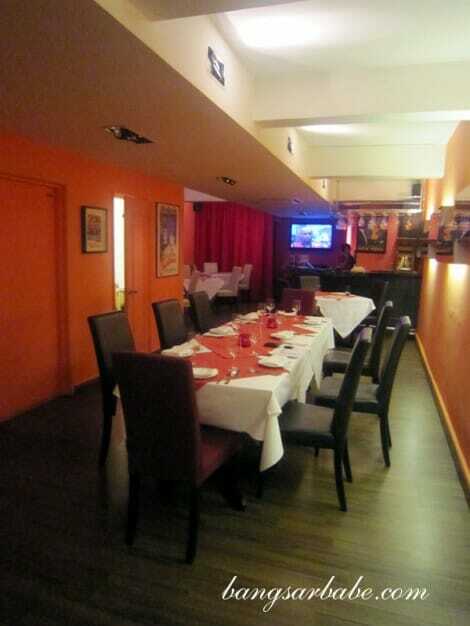 I hate French portion, but the food is good. Lol! Aria is good for one thing and one thing only…lunch. They have a lunch buffet which is 12.95 all you can eat and includes a nice assortment of mediocre food. Other than that, there food is overpriced and not well prepared. But for 12.95…even mediocre food is a good deal.